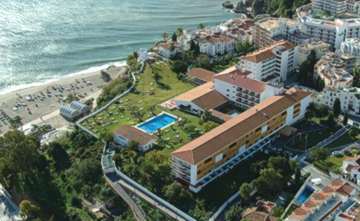 Nerja was once a sleepy little fishing town off the Mediterranean Sea, and has since grown into a hugely popular resort, guaranteeing wonderful weather all year round, miles of sandy beaches and crystal blue water. Because the mountains are so close by, during the winter months, it is actually possible to sunbathe in the morning and ski in the afternoon. Surrounded by the Sierra Almijara Mountain range to the east, the old quarter of Nerja has more or less remained unchanged, with its white washed houses that line its winding streets, and terraces adorned with flowers. There are many Plazas throughout town and all worth exploring. However, two to look out for are; the Plaza Fabrica de Los Cangrejos near Torrecilla beach, where you can enjoy a game of Petanca (or boules as the French call it), and the Plaza Tutti Frutti for nightlife. During the summer the main promenade has an abundance of artists, vendors and street musicians for your entertainment, and a huge selection of restaurants and cafes to suit every budget. It is definitely a town that loves to party. All sorts of amazing events take place throughout the year, such as the La Noche de San Juan, which is a massive all night party. All the locals and visitors head down to the shore to set up their tents and barbeques. At midnight after an evening of lots of food and wine, everyone makes a dash into the sea to wash away their sins (symbolising the baptisms of St John the Baptist). But this is not the end of the evening’s entertainment, as fireworks, bonfires and lots of dancing, continues until dawn. In the summer, Nerja also hosts the Cueva de Nerja International Festival of Music and Dance, where top international entertainers come to perform. The festival is held in one of its greatest tourist attractions, a 4km long cave that goes back five million years. Every chamber contains something spectacular, from fabulous views of stalactites and stalagmites, to cave paintings of animals. There is even a burial chamber containing human remains dating back to 6,300 BC. One of the larger caverns is transformed into a concert hall for the festival. Another popular event in Nerja is the four day Feria de Nerja Festival, which is typically Andalucian, and involves plenty of flamingo dancing and sherry! In early spring there is also a carnival with a parade of pedals, which attracts thousands of cyclists of all ages. Thanks to the express wish of King Alfonzo XII who fell in love with the town when he visited it in 1885, Nerja has its own Parador. 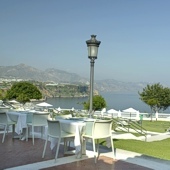 Opened in 1930, this luxury four star hotel sits on a cliff overlooking the Mediterranean and leads down to the beach. The bedrooms in the original part of the building have their own balconies, and with its beautiful garden of exotic flowers and orange trees, a swimming pool and tennis court, it must surely become difficult to pull yourself away. One of the most famous sites in Nerja is the Balcon de Europe or Balcony of Europe, a name coined by King Alfonso XII. There is magnificent walkway along the edge of a towering cliff, once the original site of a Moors castle, giving panoramic views of the Mediterranean and beaches below. In memory of the great battles that took place in the 1800’s against the French, two guns from the original fortified tower remain, and stand proudly at the end of the Balcon. On the other side of the road is the Balcon de Europe is a church originally erected in 1505. However, the existing building only goes back to 1697 and was extended in the 1700’s. The Iglesia El Salvador is a very popular choice for Spanish weddings, and more recently has held ceremonies for many foreign couples. The nearest airport is in Malaga, which is only 40 minutes away. If you hire a car, the roads take you along a lovely coastal route to Nerja. Obviously having a car will also enable you to explore the surrounding area and, one place not to be missed, are the unspoiled, hilltop villages of the Axarquia Mountains and its dramatic scenery. The most famous village is Frigiliana, north of Nerja, voted the prettiest village in Andalusia for its picturesque charm.